This digital, subscription-based chart provides access to newly updated information about the possible immigration consequences of specific, commonly charged New York offenses (now available with updates current as of July 2016). 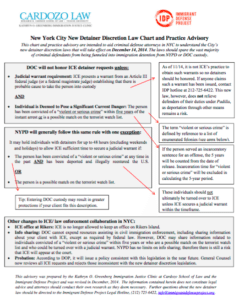 On October 22, 2014 the New York City Council passed groundbreaking legislation dramatically expanding existing city laws that limit the circumstances under which the New York City Police Department (“NYPD”) and Department of Correction (“DOC”) will honor an U.S. Immigration and Customs Enforcement (“ICE”) detainer or otherwise cooperate with federal mass deportation programs. Most of the legislation will take effect on December 14, 2014. ICE’s office on Rikers Island was officially closed down on February 14, 2015. The Immigrant Defense Project and Cardozo School of Law have created an updated advisory, including details about the legislation and the impact of the Obama Administration’s recent announcement of the replacement of S-Comm with the Priority Enforcement Program (PEP). 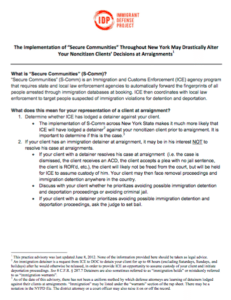 On May 15, 2012, Immigration and Customs Enforcement (ICE) activated its “Secure Communities” (S-Comm) program throughout New York State. S-Comm enabled ICE to use local law enforcement to target people vulnerable to deportation by requiring fingerprint information from booking to be shared with immigration authorities. This practice advisory explains the program and how its implementation altered prospects for immigrant clients, starting at arraignments.